Admit it, you've dreamed of running around downtown San Jose in your unmentionables, haven't you? 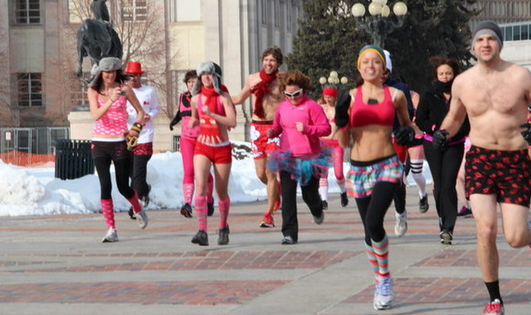 So what is the Cupid's Undie Run? Yes, it's another novelty-themed run, but for a fabulous cause. Funds raised will go to The Children's Tumor Foundation. Last year they raised $1.3 million for the cause. The run happens on the same day around the country; there's one in San Francisco, but this year they added San Jose to the mix. There are children out there suffering from a debilitating genetic disorder called neurofibromatosis (NF). NF causes tumor to grow all over the nervous system and can cause blindness, deafness, learning disabilities and severe chronic pain. So, prepare your accessories to wear with your undies and register today before all the spots are taken up. This morning on Alice 97.3 (a sponsor of the run) they mentioned there was only 100 or so spots left; so you better hurry! Get your friends together and run! Time: "The party starts at 12:00pm , run time is 2:00pm , then back for more fun until 4:00pm . Arrive early and stay late... and feel free to remain pants-less the entire time!" **Photo above is from the Cupid's Undie Run in Denver, Colorado.